You'll never see a mud hole the same way again when you've got Rough Country Recovery Systems on your side. Our high-powered, high-quality recovery solutions are durable, strong, and sure to come in handy when the situation gets a little murky. Each unit features Series Wound motors which are extremely efficient at higher speeds and less prone to overheating compared to Permanent Magnet motors. 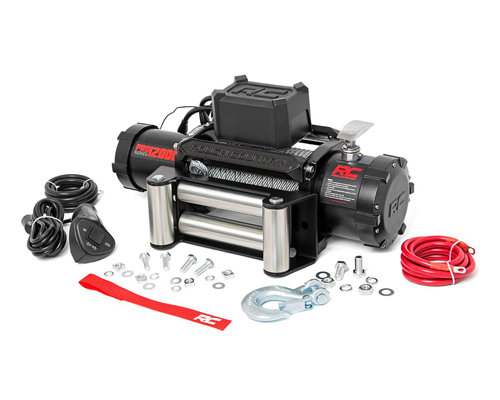 Speeds range from 5.5 HP on 9,500lb capacity units to a staggering 6 HP on 12,000lb units. Better still, Rough Country Recovery Systems utilize a 3-stage planetary gear train boasting a 265:1 gear ratio; allowing enormous torque in such a small housing. Drum Size: Diameter / Length 2.52" / 8.82"
Bolt Pattern 4 Bolt Pattern, 4.5" x 10"
Overall dimension (Length / Width / Height) 21.3" x 6.3" x 8.6"